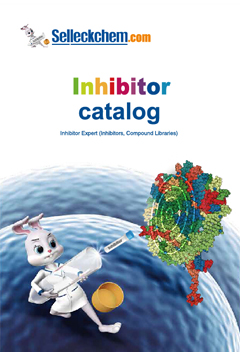 Caffeic acid phenethyl ester is a potent and specific inhibitor of NF-κB activation, and also displays antioxidant, immunomodulatory and antiinflammatory activities. Oncotarget, 2014, 5(23): 12189-202 . Caffeic Acid Phenethyl Ester purchased from Selleck. Representative apoptosis assay of LPS141 cells. Summary of apoptosis assay results. Data represent % apoptotic cells ± standard deviation (SD, error bars). Sci Rep, 2015, 5: 12580. Caffeic Acid Phenethyl Ester purchased from Selleck. Oncotarget, 2016, 7(25):38539-38550. Caffeic Acid Phenethyl Ester purchased from Selleck. Human HT-1080 fibrosarcoma, human lung A549 adenocarcinoma and murine B16-BL6 melanoma cell lines are maintained in EMEM medium supplemented with 10% FCS, 0.1% sodium bicarbonate and 2 mM glutamine. Murine colon 26-L5 carcinoma cell line, on the other hand, is maintained in RPMI medium containing the same supplements as in EMEM. These are all highly metastatic cell lines except for A-549 carcinoma. 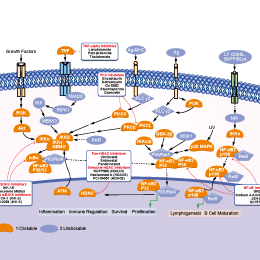 Cellular viability is determined using the standard MTT assay. In brief, exponentially growing cells are harvested and 100 μl of cell suspension containing 2000 cells is plated in 96-well microtiter plates. After 24 h of incubation to allow for cell attachment, the cells are treated with varying concentrations of test samples in medium (100 μl) and incubated for 72 h at 37°C under 5% CO2. Three hours after the addition of MTT, the amount of formazan formed is measured spectrophotometrically at 550 nm with a Perkin Elmer HTS-7000 plate reader. The test samples are first dissolved in DMSO and then diluted with medium; the final concentration of DMSO is less than 0.25%. Normal also had the same extent of DMSO. 5-Fluorouracil (5-FU) and doxorubicin HCl are used as positive controls, and EC50 values are calculated from the mean values of data from 4 wells. Natarajan K, et al. Proc Natl Acad Sci U S A. 1996, 93(17), 9090-9095. Banskota AH, et al. J Ethnopharmacol. 2002, 80(1), 67-73. Amodio R, et al. Int J Dev Neurosci. 2003, 21(7), 379-389. Zhao WX, et al. Int J Mol Med. 2014, 33(3), 687-694. Chung TW, et al. J Mol Med (Berl). 2013, 91(2), 271-282. Park JH, et al. Int Immunopharmacol. 2004, 4(3), 429-436. Andrographolide is a labdane diterpenoid that is the main bioactive component of the medicinal plant Andrographis paniculata. Sodium salicylate is used in medicine as an analgesic and antipyretic. QNZ (EVP4593) shows potent inhibitory activity toward both NF-κB activation and TNF-α production with IC50 of 11 nM and 7 nM in Jurkat T cells, respectively. Sodium 4-Aminosalicylate is an antibiotic used to treat tuberculosis via NF-κB inhibition and free radical scavenging. Features:5-Aminosalicylate is considered to be the active moiety of sulfasalazine. JSH-23 is an inhibitor of NF-κB transcriptional activity with IC50 of 7.1 μM in RAW 264.7 cell line.